Serves 10 as part of a buffet or 6-8 as a starter. 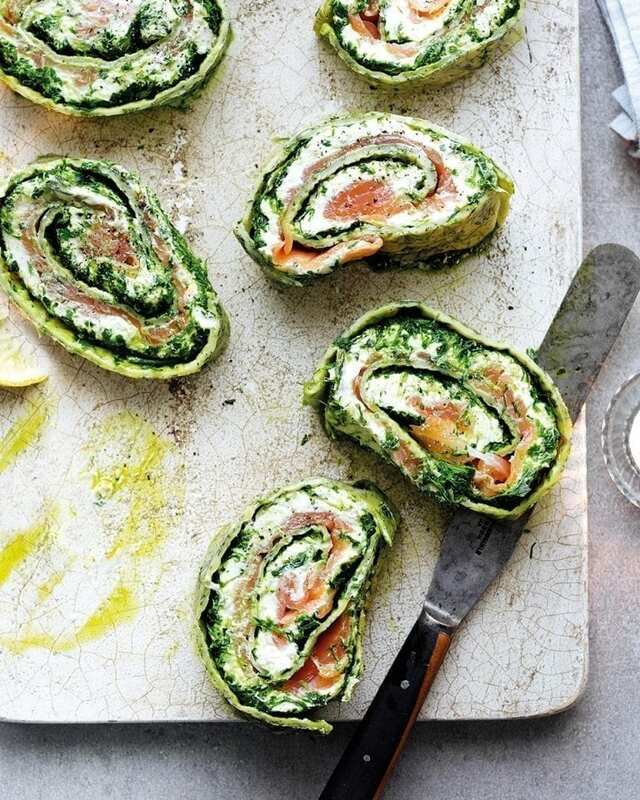 Salmon roulade is retro no more – our new take on the classic recipe combines smoked salmon with horseradish and preserved lemon to make a great addition to any buffet. Heat the oven to 200°C/180°C fan/gas 6. Grease a 22cm x 33cm swiss roll tin (or similar-size shallow baking tray). Line with non-stick baking paper, making sure there’s an overhang at the narrow ends. Mix the flour, bicarbonate of soda and salt in a large mixing bowl. In another medium mixing bowl, lightly whisk together the egg and milk until well combined. Pour the egg and milk mixture into the flour and stir together until just combined, then add three quarters of the dill and stir to mix. Scatter the remaining dill onto the prepared swiss roll tin. Pour in the batter, then gently tip the tin so the batter spreads evenly and reaches all four corners. Slide the tin into the oven and bake for 10 minutes until just golden at the edges. Remove the tin from the oven. Holding the overhanging ends of the baking paper, lift out the pancake and flip it over onto a fresh sheet of baking paper, the same size as the first. Gently peel off the top layer of baking paper, then transfer the pancake, still on the clean baking paper, to a wire rack to cool. Put all the herb paste ingredients into a food processor and whizz to a rough paste. Put into a small bowl, cover with cling film, then clean the food processor bowl. Put all the cream cheese filling ingredients into the food processor and whizz until well combined but still with visible chunks of preserved lemon peel. Chill for 30 minutes. Spread the herb paste over the pancake using a palette knife. Next spread over the cream cheese filling, being careful to not disturb the herbs too much – it helps to dollop the mixture on evenly, then gently spread out the filling. Top the cream cheese with a layer of smoked salmon slices, then roll the pancake into a cylinder, starting at one of the narrow ends. Use the baking paper to help you roll the pancake and press down gently so it holds its shape when cut. Take care not to press down too much, though, or the filling may be squeezed out. Put on a plate and chill for 1-2 hours. Slice into rounds to serve. You can use any combination of soft herbs you like for the herb paste. Make the cream cheese up to 12 hours in advance and keep covered in the fridge.